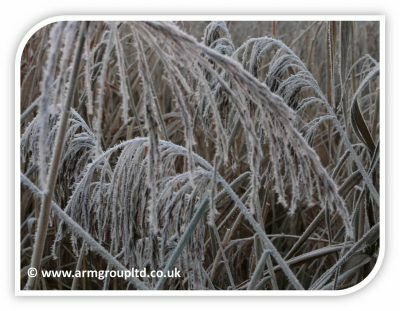 The question of the performance of reed beds or treatment wetlands through winter and in cold climates is a common one. Reed bed systems in general are subject to the changes in local climate conditions particularly temperature. They are, however, used and operate successfully, all around the world including the northern United States and Canada where air temperature can remain well below freezing for extended periods. Popular belief is that treatment is associated with plant growth and that winter die-off adversely affects performance. In truth, the treatment performance is related to bacterial activity, and are essentially attached growth microbial reactors. Using below ground systems and mulch or reed litter for insulation, over 50 wetlands are currently being operated year round in cold climates in North America with consistent performance. In each case, the success of performance is related to creating a stable environment for bacterial growth and sizing the wetland to accommodate slower bacterial removal rates associated with winter water temperatures. There are numerous case studies from around the world which have increased our understanding of the heat balances that occur in wetlands across the year and the best means of mitigation under freezing winter conditions. Our designers have over twenty years of experience routinely designing and installing treatment systems combining lagoon and wetland technology and in North America they are capable of operating at short-term temperatures as low as -40°C. The operating temperature of a wetland treatment system is governed primarily by the temperature of the effluent within the system. The water temperature in reed beds is determined by energy gains and losses which fluctuate throughout the year and can be critical to certain removal mechanisms. On entering a reed bed effluent temperatures rapidly stabilise around a balance point temperature, where energy inputs and outputs are balanced. In the warmer months, balance point temperatures stabilise closely around average air temperature. 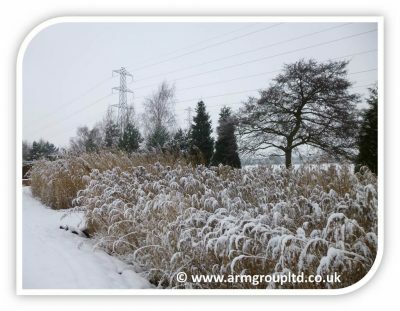 In the colder months system design and operational management can be used to maintain performance depending on local climate conditions. In Surface Flow Systems the ice and snow are often the most important insulating layers. An ice/air ‘blanket’ is often purposefully generated by raising effluent levels to allow it to freeze and subsequently lowering it, leaving an air gap between the ice layer and the effluent. In Subsurface Flow Systems the reed litter and/or additional peat/mulch can be added as insulation. The net effect of these methods of insulation is to produce a balance point water temperature that is a few degrees above freezing allowing key treatment mechanisms to continue operating in severe weather conditions. A review of the local climatic conditions is undertaken in the detailed design phase of a project and relevant heat balance calculations will determine exactly what mitigation steps will be needed for the system be it mulch, water depth, covers or other operational factors. The civil components of the plant will also be reviewed with respect to frost protection as in any other construction project. If you have queries on the above or other aspects of the proposed scheme please do not hesitate to contact us.